You want to be the whole pretty package, right? Having a voice that’s congruent with your image is a big part of that. No surprise here, but if your voice is too deep you’re going to be read as male. Trying to mask a deep voice by speaking in an unnaturally high voice – otherwise known as falsetto – isn’t good, either. Speaking this way doesn’t make you sound like a woman – it makes you sound like Minnie Mouse. While you do want to raise the pitch of your voice, you never want to go too high. Again, a frequency tuner can help you find your correct range. If you are self conscious about your voice, then you might try to compensate by speaking more softly. However, lowering the volume of your voice doesn’t make you sound more feminine – it just makes it impossible to hear you. Women naturally have more “melodic intonation” to their voices. In other words, they are more animated when they speak. Some crossdressers and transgender women make the mistake of trying to imitate this by “upswinging” their voices at the end of every sentence. “Upswinging” can make each sentence sound like a question. All this does is make you sound like a stereotypical Valley Girl – probably not the type of woman you want to emulate. If you try to compensate for your deeper voice by constricting your throat, the result will sound pinched. Think Pee Wee Herman or Kermit the Frog – again, not who you want to emulate! It’s easy to go wrong in your attempts to feminize your voice. The good news is that you CAN achieve a passable feminine if you use the right techniques. I’ll be talking more about voice feminization in future posts. Before I do that, I’d love to understand how important this issue is for you. Please take my poll below. And as always, I’d love to hear your thoughts in the comments! P.S. 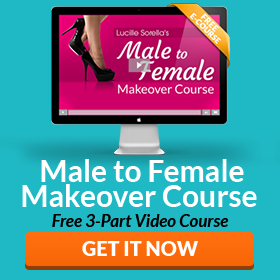 Are you ready to feminize your voice in the next 30 days? I highly recommend speech pathologist Kathe Perez’s 30 Day Crash Course Voice. This guided voice feminization program will give you the tools and training you need to achieve your goals. How important is achieving a passable feminine voice to you? I highly recommend training with Kathe Perez. I did one-on-one personal training with Kathe via Skype and she was really excited for me and the progress I made. When speaking to her during the course of each session, if my voice would go too low, she would put up her hand as if to say “STOP!” She said either you speak like a woman or don’t speak at all. It was great training. On a recent stay at a hotel, I had three different women address me as “ma’am.” That felt so awesome! I’m gonna need help applying makeup as I’ve never done it before. Anyone?